The Andhra Pradesh government today woke the jobless youth of state with a good news of phase-wise recruitment on 20,000 government posts lying vacant.The decision was taken during a Cabinet meeting by Chief Minister Nara Chandrababu Naidu anounced Information and Public Relations Minister Palle Raghunatha Reddy. 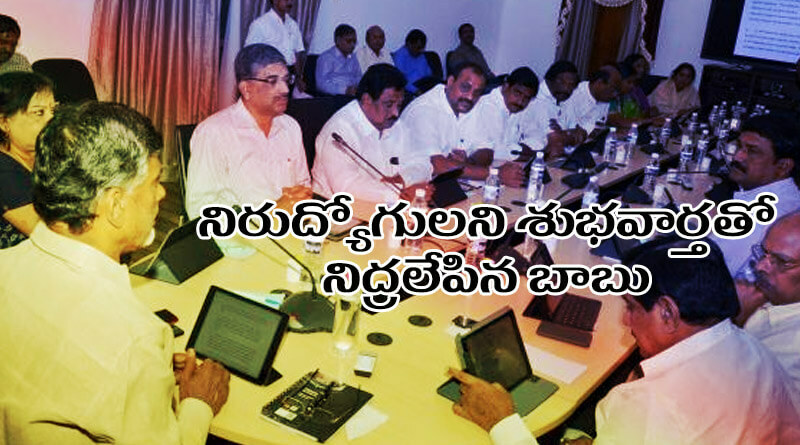 As known “Thousands of government jobs are lying vacant but given the financial constraints faced by the state, we are taking up ‘need-based recruitment’ to fill the vacancies,”are the words of Finance Minister Yanamala Ramakrishnudu during assembly sessions.He even announced in his Budget speech that the Finance Department was in the process of according permission for filling 20,000 posts through direct recruitment. After a detailed discussion on this issue, the Cabinet gave green signal for filling up 20,000 vacancies in a multi-phased manner, announced Palle Ragunatha Reddy after the meeting.It is known that the permission were already given to fill 12,358 posts in various categories of administrative, technical and managerial services through direct recruitment.